Spice Diana and Moze Radio after shooting the Chuma video and inset is the singer at his last performance at Amnesia. 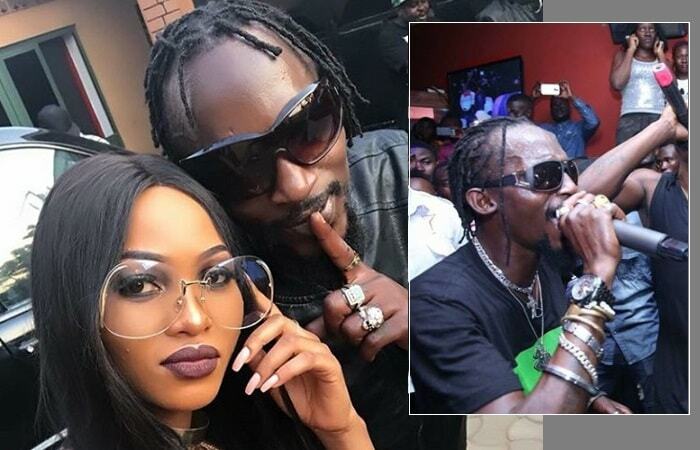 Spice Diana and Moze Radio had become so close that when she graduated recently, the Goodlyfe duo of Moze Radio and Weasel surprised her with a party. It was Moze Radio who drove her to the party venue, but not disclosing where exactly they were headed to and for what purpose, she sobs while explaining. Spice Diana's show slated for tomorrow at Front Page Hotel in Nansana has for obvious reasons been cancelled. Moze was among the artists that were to perform, but on that day (tomorrow), he will be lying-in-state at the National Theatre. "This year is your year Spice"
"You promised to write for me 4 songs this year. The Surprise you made for me at my graduation when you personally drove me to the surprise party. You only wished me well RADIO. You have been my mentor, my inspiration, my friend." "Am so sorry to announce that I and my management are pulling out our concerts which were due this weekend and we will communicate a new date at a later stage after laying our brother to rest, hope you can all understand." Radio and Weasel had a song dubbed 'Chuma' featuring Spice Diana that they had just recorded a few days before the bar brawl in Entebbe. The concert has now been postponed to February 9, 2018.